The Sabarna Roy Choudhury family today is spread throughout the whole World. The main settlements are at Barisha, Halisahar, Uttarpara, Nimta, Birati, Kheput etc. In all these places the family members believe in one tradition, culture and faith. Everywhere the legacy of Laksmikanta continues. At the biggest settlement at Barisha itself about two thousand family members live. The settlements at Barisha are divided into nine houses. Today each of these nine main houses have expanded into a number of other buildings creating a Para on the name of the main house due to expansion of the family. But still the basic bond of a single joint family has not been destroyed due to the western influences. During any festivals or social programmes every member of the family try to participate and enjoy the very occasion. Thus everywhere in the Sabarna Roy Choudhury family, a bond of brotherhood and an idea of a big joint family can be seen. A brief history of each of these nine houses or settlements at Barisha alongwith the introductions of the Durga Pujas are narrated here. 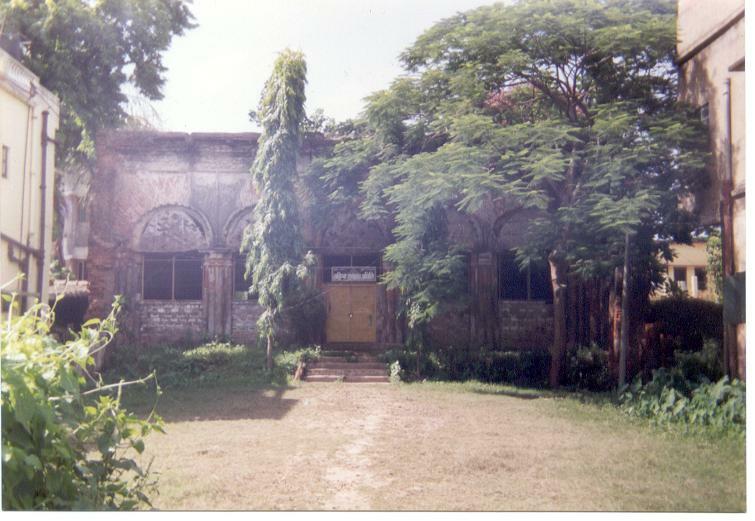 Roy Krishnadev Majumdar Choudhury established this house in 1710. He built a grand and the biggest Durga-mandir of the family, the first of such kind in Kolkata, and introduced another Durga Puja in 1717. He also built a temple dedicated to Lord Jagannath and introduced the Chariot festival (Rathayatra) in 1719 which is at present the oldest chariot festival in Kolkata. Both the Durga puja and the chariot festival today are well recognised. The Annapurna temple is a part of this house. This was the first settlement of the family at Barisha. Lakshmikanta constructed some sort of a Kutchery Bari soon after receiving his estates in circa 1608. Here he later constructed a traditional Chandi Mandap to house the first ever Swaparibara Durga Puja celebration of Bengal in 1610, inspired by his wife Bhagawati Devi. This brought for the first time Goddess Durga being worshipped with Lakshmi, Saraswati, Ganesha and Kartikeya. Today this Puja is considered as the oldest Durga Puja in Kolkata and is highly regarded among the masses. The adjacent Radhakanta temple and the twelve Shiva temples are also of traditional architectural pattern and are objects of interest to tourists. The Kalikingkar house was established during the first half of the 18 Th century. Here the Durga Puja was introduced by the founder of this house Roy Raghudev Majumdar Choudhury in 1739. Now the present members of this house have formed the Kalikingkar trust and looks after the traditions and cultures of the family. The Mejo Bari was founded during the fourth decade of the 18 th century. Here the founder Ramcharan Roy Choudhury introduced the Durga Puja in 1785. This house is situated just opposite of the Atchala Bari. It is also called as Mejo Bari (Krishna Govinda Lodge). Mahesh Bhawan, better known as Chandi Bari was established during the first half of the 19 Th century by Harachandra Roy Choudhury. He started a Durga Puja in circa 1810 but later on in the beginning of the 20 Th century with the death of Jagat Chandra Roy Choudhury, the Puja was discontinued. Today the house is renowned for its Chandi-mandir and Chandi Puja. The Majher Bari was founded during the first half of the 19 Th century and the Durga puja was introduced by its founder Harekrishna Roy Choudhury in 1830. But as a protest against the Partition of Bengal and the transfer of the capital from Calcutta to Delhi, the puja was stopped in 1911. Later on in 1993, the present members of the house again reinstituted the festival. Umacharan Roy Choudhury established the Jadunath Bhawan in the 19 Th century and introduced the Durga Puja in 1840 but later on due to lack of initiative and other reasons the Puja was discontinued. Nothing of the original building now remains. Established during the same period as the Mejo Bari by Radhacharan Roy Choudhury, here the Durga Puja was started in 1790 but later on, in the middle of the 20 Th century it was discontinued. Neither the Durga- mandir nor any old building which was a part of this house now remains. Barisha Haribhakti Pradayini Sabha was founded by the members of this house. Benaki Bari got its name from bena plants, as the place where it is situated was full of bena plants. This house was founded by Ramcharan Roy Choudhury in the 18 th century and the Durga Puja was perhaps introduced by Ramchand Roy Choudhury in 1842. The big Durga Mandir of this house also attracts visitors.